09/23/2013 09/24/2013 Mike S.33 Comments on When Life Gives You Lemons, the famous Springfield Lemon Tree! 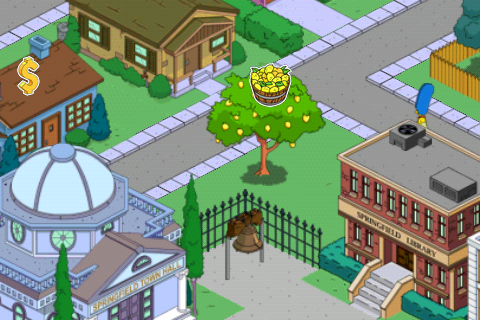 When Life Gives You Lemons, the famous Springfield Lemon Tree! Here again to bring newer players some insight and long-term players some wisdom they may not have already known. The Lemon Tree is one of the most sought after in-game items. It is also one of the hardest to acquire as it is not available in any form other than through a Mystery Box. Because of this, each player only has a 10% chance of obtaining a Lemon Tree which makes it that much more desired. I’m going to give you a brief history on the Lemon Tree and it’s impact on your town. For those of you who do not already know the Lemon Tree actually is a very historic and famous tree in the city of Springfield. It was planted over 100 years ago around the same time that Jebediah Springfield and Shelbyville Manhattan were founding Springfield and Shelbyville respectively. At the time the lemon was the sweetest fruit around hence the planting of this tree. Just about all we know of the history of the Lemon Tree comes from the 127th Simpsons episode titled “Lemon of Troy” (Season 6, Episode 24). In this episode the children of Shelbyville hatch a plan and steal the Lemon Tree from its sacred resting place in Springfield. 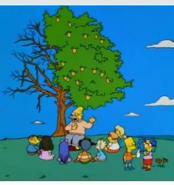 The children of Springfield, having realized the theft by the Shelbyville kids, conspire to get their tree back. The tree ends up in a Shelbyville impound lot and Bart devises a plan to hide, with others, in Flanders’ RV and park it illegally in order to get it impounded as well and it was returned to its rightful spot and has remained there ever since. TopixFact: Tourists to Springfield are forbidden from picking or eating the fruit of the Lemon Tree due to the radioactive hum quietly emanating from all the fruit of Springfield. 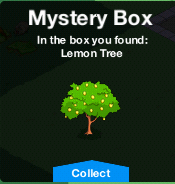 It is possible to obtain the Lemon Tree for free if you haven’t acquired it yet and receive one in the 5th day Mystery Box reward. TopixFact: The Lemon Tree and the Houseboat are the ONLY decorations in the game to generate income that are available full-time. There are past items that do however they are not available anymore. However the Lemon Tree is the only one with no requirements to acquire. Having the Lemon Tree in your town is purely a matter of sheer luck. Whether you should make any and all attempts to obtain it is strictly your call, however, it is probably the most unique item to have. While it doesn’t contribute to the Conform-O-Meter in any way it still is a good item to have. It earns a bit of extra income and if your lucky you can win one without spending a single dime allowing you to instantly profit from the first collection. The files and all of the sites say there is a 10% chance of winning one through the purchase of a Mystery Box but honestly I now have 3 towns (I know : () and have acquired a Lemon Tree in all 3 towns almost instantly. The most it has ever cost me for one was 4 Mystery Boxes. My first advise would be to wait it out for the 5th day Mystery Box reward, there’s really no need to buy one if every 5 days you get one free. Everyone I’ve ever heard from on this topic have all received their Lemon Tree fairly quick in a free Mystery Box. The good thing about this item is it is permanent so it’s not going anywhere. It does add that unique touch to your town when you do win one though. I love the Lemon Tree, in fact, it is the first item I look for in a friends town to tap on. While I can’t say go right now and buy it, it is an item I think all towns should have. The fact that it is a reward certainly puts a smile on my face whenever I see it glowing in my town. Thanks for reading! Doesn’t the snake rocks count as a decoration? They generate income since whacking day. Are you sure it can be stored? I feel like I tried to once during a major redesign and I got the “sorry hoarder” message, but I could be wrong. I stand corrected. You are absolutely correct. I tried mine in a rush when I created the post and must have tapped the wrong item to store. Thank you, will edit the post. You can try and put a ticket in with EA and see if they’ll do anything. Nah I didn’t buy any boxes. I’ve been playing since August of 2012 and not received one! Going to go buy some boxes. Wow, really? That’s crazy. I assumed since all mine came quickly that everyone’s would. Looks like they want you to work for it or pay for it. Anybody know what to do with 2 trees? I have one in my town and got another one and it just sits in my storage? Can’t sell it or plant it. There’s supposed to be a fix that was already released but a lot if people still have 2. There’s really nothing you can do except wait for EA to remove it. Great job on the site!! I started on the old site last January. Glad you guys have kept it going adds to the game. It was my first prize in the mystery box. I started playing a year ago during the Halloween promotion last year. I’ve been playing daily only missing a day once or twice so I’ve gotten a free mystery box every 5 days for a year. I’ve never purchased a mystery box with donuts. I received SVT within a few weeks of starting but it took until last month, roughly 70 mystery boxes, to finally get a lemon tree. I’m not saying you should buy boxes in order to get the lemon tree but it did take me an unreasonably long time before I got lucky. Maybe that’s all it is is bad luck. I’ve also been playing the long shot 99:1 dog at the race track ever since the odds and payouts changed and have yet to get a win so maybe it’s just me. Wow that is a long time. See I don’t have patience like that. As soon as I first headed of the lemon tree I immediately bought boxes until I got it. And I always play the 9:1 dig I think it is, the 3rd choice. I just won last night and haven’t win in 6 months. It took me 5 months to get it. Wow, really? I’m sure you did not buy any boxes? Still that’s the longest I’ve heard. Nah didn’t buy any boxes (maybe the odd one when I started). There’s been an update and homer and Lisa are talking about Halloween!!!! I can’t start the mission for another hour tho as Lisa is busy in KL boo! Just received an update. It looks like halloween! Lisa kicks it off by searching for spoilers on tapped out forums! Looks like Halloween is starting early! Just had a task to make Lisa check the tapped out forum to see what’s happening this year! You’re correct but they have to be bought or earned and yes are no longer available. Maybe I should word it better. When I first started playing, it never occurred to me to go online to find neighbors. Instead, I created like six accounts to be my own and complete the “I choo-choo-choose you” quests. On literally every single account I’ve ever had, I got the lemon tree on the first or second weekly reward mystery box. So I would definitely recommend just being patient rather than spending donuts. Because, even though the odds seem really high of receiving one, it’s not worth the risk that you’ll just get a tree or a picket fence! That’s my opinion, at least. Now I wait for a turnip field even though that is in Shelbyville. Wait that gives me an idea. EA I want a Shelbyville expansion now. Ha ha I was thinking about that the whole time I was writing and researching this. Wouldn’t that be great?! Then we could play football against them and they can beat us nearly half the time. I’d love to see a Shelbyville (or Capitol City) expansion similar to Krustyland!